SSG Riding Gloves has a variety of gloves sure to match your individual needs. Ed James started SSG Gloves 25 years ago to serve the unique needs of the harness horse driver. An owner of harness horses for the past 30 years, James says drivers started telling him they needed better gloves." You have to listen to what the customers want, and then you have to provide it for them," he says. "Listening the what the drivers were saying lead to the development of the first gloves we ever sold. They needed a glove that would keep their hands warm, but with out any bulk. They need flexibility." What Are The Best Gloves For Warm Weather? The most popular All Weather® glove in the industry worldwide. Quality, durability, fit and comfort. Part of Eric Lamaze’s rise to success! The best of both worlds: Appearance, Grip & Durability. What Are The Best Gloves For Colder Weather? Try them, you’ll love them– Even in your car! Do You Carry Specialty Riding Gloves? Absolutely! We carry Dressage, Endurance, Hunter and Jumping, Polo and much more! Please view our website to see all of the quality gloves we carry. Buy Your SSG Specialty Gloves Today! SSG Riding Gloves offer protection, style and security while working and riding your horse. Our gloves are affordable, versatile, long lasting, and come in a vast selection sure to meet the needs of riders today. Once you start riding with them, you'll never want to be without them again! 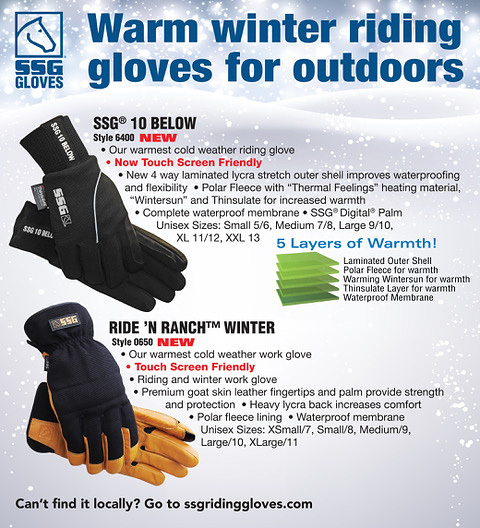 Many Tack Stores and Horse Catalogs like DoverSaddlery, SmartPakEquine, JeffersEquine and more, carry SSG Riding Gloves.